Be the first to share your favorite memory, photo or story of Brandee . This memorial page is dedicated for family, friends and future generations to celebrate the life of their loved one. On Sunday, January 20, 2019, Brandee Marie Grisham accepted a job opportunity of a lifetime which was offered to her by our heavenly Father. She was offered a managerial position at Heavenly Angels Sassy Salon. At this salon, she is given the freedom to transform all of the heavenly angels that have gone before her. Brandee is a highly sought-after stylist due to her uniquely creative abilities. In addition to her precision cuts, Brandee is a true artist when it comes to hair color. It is unfortunate that she will no longer be able to exhibit her talents through her earthly models: daughter Tayla (16), son Gavin (11) , daughter Aubrina (3), brother Matthew, sister-in-law Randi, niece London, mother Sheila and father Steve. Brandee was such a giving person here on earth. Her best trait was her willingness to always put other’s needs before her own. To honor Brandee’s giving nature, we will be naming a scholarship in her honor for cosmetology students at Emily Griffith Technical College. The annual scholarship will be given to a student in financial need so that they may achieve their creative dreams. Donations can be made to Emily Griffith Foundation, 1860 Lincoln Street, Suite 604, Denver, Colorado 80203. In the memo line please include: in honor of Brandee Marie Grisham. Arrangements: Celebration of Life for Brandee Marie will take place on Friday, February 1, 2019 at 10:30 a.m., at Peace Lutheran Church, 5675 Field Street, Arvada, Colorado. The family has requested that everyone wear pink which is Brandee’s favorite color. A lunch reception will be provided. There will be a balloon release at Fantastic Sam’s located at 7735 Wadsworth Boulevard following the luncheon. Everyone is invited to participate. 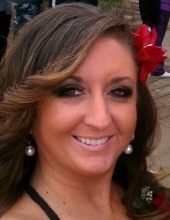 To plant a tree in memory of Brandee Marie Grisham, please visit our Tribute Store. A lunch reception will be provided. "Email Address" would like to share the life celebration of Brandee Marie Grisham. Click on the "link" to go to share a favorite memory or leave a condolence message for the family.